Camping in the winter makes the W Trek a wilder, tougher challenge. Temperatures can be extreme but the winds are often milder than in summer and the park as a whole is much quieter. On a clear day you'll see the iconic sights transformed by the season, making it all worthwhile. 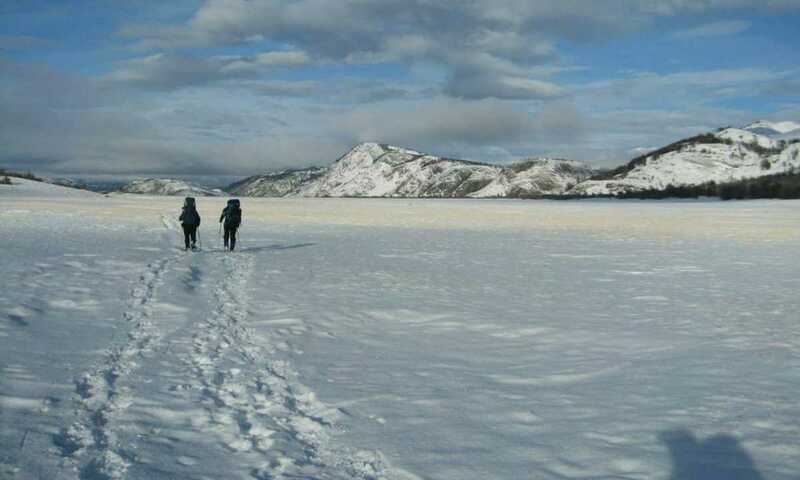 Easy hike around Lake Scottsburg, admire Cuernos & night in Camp Italiano. Sometime today you will board a bus in Punta Arenas city centre, or at the airport (PUQ) and be taken directly to Puerto Natales. The journey takes approximately 3 hours (2.5 hours from the airport). Along the way you will catch your first glimpses of guanacos, the ancestor of the llama, and ñandus, a relative of the ostrich and emu. When you arrive in Puerto Natales you can either take a taxi or walk to your accommodation. Shortly afterwards you will come to our office for a briefing to go over your itinerary and allow us to answer any last minute questions you may have. Early in the morning you and your guide will leave Puerto Natales in a private transfer heading towards Torres del Paine National Park. You will be taken to the park’s administration office and be given a bit of time to look around and fill up your water bottles before beginning your hike. The hike is across softly rolling hills and will lead you to an amazing viewpoint of Lake Pehoe and the well known Cuernos. 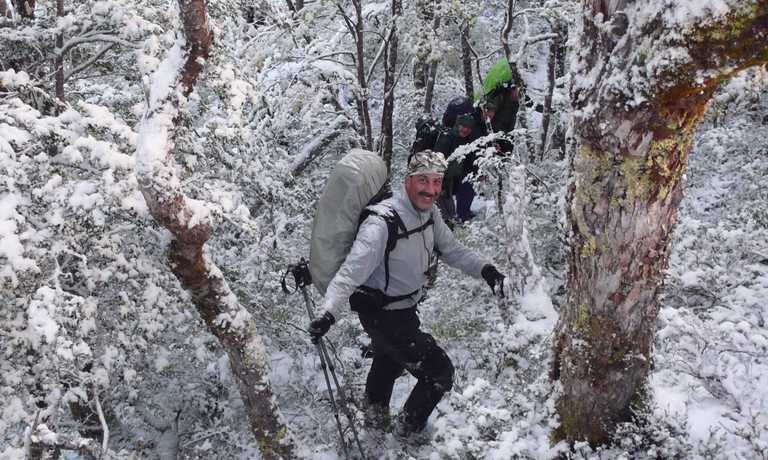 It is approximately a 5 hour walk and you will arrive at Camping Paine Grande just before dinnertime. You will leave the campground and begin walking towards Glacier Grey. The hike to the first lookout is approximately 2 hours and the hike to the second lookout is approximately 4 hours. Whether you choose to reach the second lookout depends on your speed, energy level, and desire. In the evening you will return to Camping Paine Grande to spend the night. Shortly after breakfast you will begin hiking towards Campamento Italiano. This camp is 2.5 hours away. Along the way you will walk along Lake Skottsberg and admire the tremendous Cuernos in front of you. Once you arrive at Campamento Italiano you will set up camp. Depending on the weather and the amount of daylight left you can continue into the valley or you can take a shorter excursion exploring off the trail with your guide. After breakfast you will begin your hike into the French Valley. Leaving your large pack at camp you will hike into the French Valley with just a small daypack. You will hike across a moraine and through a forest until you come to a clearing. Here you will be blown away by both the wind and the spectacular views of Lake Nordenskjold, Skottberg and Pehoe behind you and the hanging French Glacier ahead of you. After leaving the lookout you will return to Campamento Italiano to gather your large pack and continue another 2.5 hours to Camping Cuernos where you will spend the night. This section of the hike is along rolling hills and follows the coastline of Lake Nordenskjold. In the morning you will have breakfast and then prepare to hike again. You will leave Camping Cuernos, located on the shore of Lake Nordenskjold and at the foot of the Cuernos and walk for 4 hours towards Camping Chileno, located in the Asencio Valley. Along the way you will pass by Lake Nordenskjold and begin your hike up Almirante Nieto, a mountain with incredible views of Lake Nordenskjold and the Asencio Valley. There will be a few rivers you will pass over by hopping across rocks. As you hike you will catch glimpses of glaciers and the mountaintops hovering over you. Finally you will arrive at Camping Chileno to have dinner and sleep. This morning you will continue your walk up Almirante Nieto, first hiking about an hour through a dense Lenga forest. After leaving the forest, you will approach a moraine and climb to see the amazing granite peaks known as the Torres. After a bit of time admiring the view you will return to Camping Chileno to collect your belongings and hike to the foot of Almirante Nieto where you will first catch a shuttle to the park entrance and then catch a bus back to Puerto Natales. Today you will take a bus back to Punta Arenas city center or Punta Arenas airport (PUQ) and continue your journey home or to your next destination. Thank you, thank you, thank you for sorting out the most unforgettable trip which gave me and my father such mind-blowing memories that we will cherish forever. Price is indicative of a group of 6 people. For a group of 4 people the price is approximately USD $1890. This trip can run as a group trip, with prices starting from $1,681 per person for a complete group. If you are looking to join a group or you are a solo traveller we will help to form likeminded groups of travellers. Please let us know your travel plans.